Gladys Best was just out of Rhea Central High School when she went to work for the Register of Deeds office as a typist. Gladys became the interim Register of Deeds in 1962. Later, she won the election to the office. Little did she know at the time that she would hold claim to the office through a total of 14 elections. 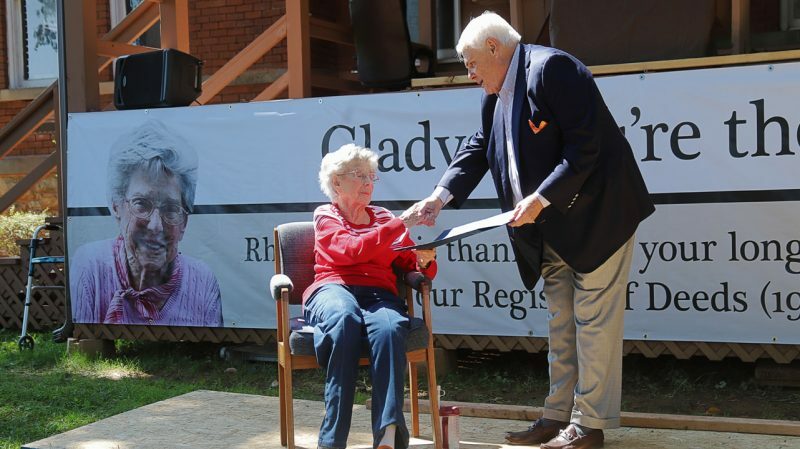 Gladys has always been devoted to the people of Rhea County. She has always made everyone who came into the office feel welcomed. There were no political party lines in her office, just the good old folk from Rhea County whom she called her friends. Earlier this year, Gladys made the decision not to seek re-election and chose to retire at the end of this term. Once it was learned that her seat would be open, the following persons Teresa Hulgan -The current Deputy Registrar, Dicey Brown, Adam Hurst, and James Nevans submitted qualifying petitions seeking the office. Deputy Register Teresa Hulgan went on to win the primary election in early 2018 and later claimed an un-opposed General Election victory. 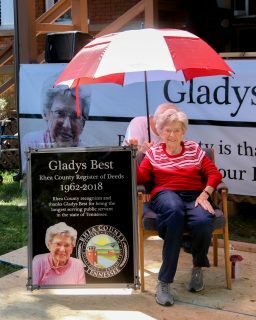 On Friday August 31, 2018, the last official day in office, Gladys was honored with a “Gladys Best Day” celebration on the courthouse lawn. Rhea County Executive George Thacker welcomed everyone and announced that there were refreshments for everyone to enjoy. Tennessee State Senator Ken Yager spoke briefly and presented Gladys with a certificate signed by Tennessee Governor Bill Haslam proclaiming her to be the longest serving elected official in Tennessee. Rhea County officials also unveiled a large plaque that will hang in honor of Gladys near her office in the Phil Swafford annex building. A similar one will also hang in the courthouse where Gladys had her office for many years before it was moved into the courthouse annex. A line quickly formed and stretched across the courthouse lawn as people waited their turn to speak to Gladys to wish her well and express their thanks for all she has done. The newly elected Registrar, Teresa Hulgan spoke briefly thanking the voters for electing her to fill Gladys’ position and also thanked Gladys for hiring her some 35 years ago right out of high school. “I have to thank her for all that she has taught me. She is leaving behind some mighty big shoes for me to fill”, stated Hulgan.